Mini-Kits stock a range of commonly used Mitsubishi RA series Modules and can supply other currently manufactured types in quantity by special order. 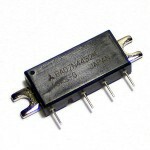 Please note, that we cannot supply the older M series transistor type modules as they are obsolete, but many of the newer RA series MosFET types can be used with some modification to the bias circuitry. Mitsubishi RA07H4047M 7 Watt RF MosFET amplifier module for 12.5 vdc porta..
Mitsubishi RA07N4452M 7 Watt RF MosFET amplifier module for portable Radios that..
Mitsubishi RA08H1317M 8 Watt RF MosFET amplifier module for 12.5 vdc porta..
Mitsubishi RA18H1213G 18 Watt RF MosFET amplifier module for 12.5 vdc mobile ..
Mitsubishi RA30H0608M1 30 Watt RF MosFET amplifier module for 12.5 vdc mobile Radios..
Mitsubishi RA30H1317M1-501 30 Watt RF MosFET amplifier module for 12.5 vdc mobile ..
Mitsubishi RA30H2127M 30 Watt RF MosFET amplifier module for 12.5 vdc mobile Radio..
Mitsubishi RA30H3847M1 30 Watt RF MosFET amplifier module for 12.5 vdc mobile Radios ..